"Prophet!" said I, "thing of evil— prophet still, if bird or devil! The works of Edgar Allan Poe combined with the silver screen has always brought forth mixed results. Not necessarily because the films are bad, Poe is lucky to have his tales brought to life by some of horror’s greatest legends, but because his short stories are just that – short, if they’re stories at all. Stretching most of Poe’s stories and poetry into a 90-minute film is downright impossible, thus some liberty must be taken with the subject matter. AIP did it well on almost every occasion and many years prior, Universal tried their hand on his works much the same way. 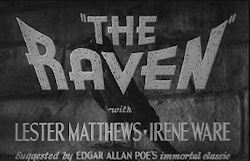 The Raven is very unique, taking aspects from a few of Poe’s stories and mounting them into an hour long film all the while combining elements of “truth” from the author’s life. Madness and gothic horror. It’s a match made in Heaven. Or is that hell? A young woman named Jean (Irene Ware) is driving in a rainstorm and loses control at the wheel, violently crashing her car. She is taken to the hospital where the doctors claim they have done all they can for her. It’s impossible to save her life. Her father and her boyfriend, Jerry are by her side during this ordeal and can only think of one man to help their loved one and call Dr. Vollin (Bela Lugosi), pleading for help. He is retired now, only doing research, but they convince him to come in and perform one last procedure. Dr. Vollin saves the girl’s life and not only is he a great doctor and musician, but he is also a collector of the works of Edgar Allan Poe. Collector may not be the right word, the man is obsessed with Poe to the point that he has built his own murderous pendulum in a hidden room in his mansion. Whether it’s just for kicks or not isn’t known just yet. The Raven is another classic of gothic horror that few seem to know about, or if they know, just don’t seem to pay attention to. Boy, are these people missing out. Unlike Universal’s The Black Cat, this film actually has Poe influences rather than using the name purely for media promotion. No, you won’t see any scenes lifted straight out of the poem, but the film’s foundation is the poem itself. The young scholar would be Bela Lugosi’s character, Jean would obviously be Lenore and the entire movie basically encompasses the poem in a roundabout way with his soul being tortured by events that have occurred. It’s not exactly the poem, but close enough to have a lot of fun with. 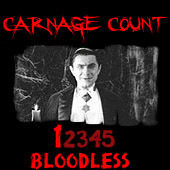 With the Lugosi and Karloff on board, you know this one will be no slouch when it comes to professional acting, either. Elements from other Poe stories are prevalent, as well as subtle references. The Pit and the Pendulum is the one mostly featured, along with The Cask of Amontillado and The Tell-Tale Heart, although these are much more subtle. Of course, the movie takes liberty with Poe’s life, citing a woman named Lenore as his real-life wife, so don’t go into this one looking for historical accuracy. It’s fiction within fiction within fiction really, combining some faux history on Poe’s life, including portions and borrowing heavily from The Raven, and then the screenplay the movie is actually based on. Well-spoken Dr. Vollin is essentially a melting pot of recurring themes from the works of Poe. The underlying message of the film is taken from the poem, but the story of the film is its own thing, and a very good gothic terror it is. There are many scenes that Karloff and Lugosi share and both of the actors play their roles great with Lugosi wonderfully out of his mind and Karloff just trying to get on with his life. There’s much more to the film than the simple synopsis above, I purposely left out a certain very important portion of the film because there’s simply no use spoiling it. 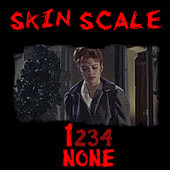 The film’s short running time makes the film fly by in no time and if you were to explain the interaction between the characters of Edmond and Dr. Vollin would be spoiling the movie completely. Let’s just say Edmond ends up looking a lot more ugly than before and with the doctor dealing the cards, he’ll have to play his hand very carefully. The gothic setting is terrific with plenty of thunderstorms and the gloomy hidden room where Dr. Vollin hides his Poe-tic tools of destruction is a fine backdrop for the madness that ensures. There’s no shortage of great lines spoken by Lugosi, as is the case with most of his films and his delivery is spot on. The greatest attribute of the classic horror film is the ability to captivate you with poetic dialogue rather than relying on blood and violence. The unique thing about these films is that they are basically like reading a story by Poe, except you don’t have to visualize the macabre – you get to see it with your own eyes. They aren’t dumbed down, to put it bluntly. It’s just too bad that “forgotten lore” such as The Raven don’t get the credit they deserve from many horror fans, ones that don’t see that blood and gore isn’t necessary to have a completely diabolical movie. It’s their loss. Universal’s DVD is great, the picture has its blemishes but it is to be expected from films from this era and the sound is phenomenal, you’ll never have to strain to hear what the actors are saying. “I’m the sanest man who ever lived. But, I will not be tortured. I tear torture out of myself by torturing you!” Buy it!